So 2012 is nigh! I’ve come to the end of my 101 in 1001 challenge, so I suppose it’s time to reevaluate my reading life. About a year or so into my 1001 days, I added “Read All Newbery and Caldecott Winners” to my list. Little did I realize how lonnnnnng and ollllllld and dulllllll some of the old winners would be. 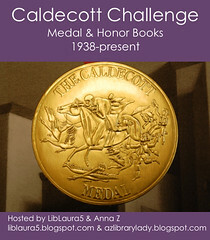 I succeeded in reading all the Caldecott winners and a good chunk of Newbery winners, but not what I had hoped for. So it’s time to regroup. I’m trying to remain aware of the fact that I’ll be finishing my National Boards this year and I already have some responsibilities at the district level, but I think I can commit to a few things. 1. 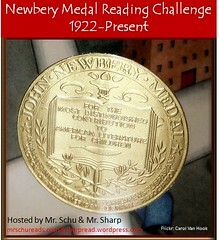 I will read or reread any Newbery medal winners I haven’t read in the past five years. I set my limit at five years because as I mentioned, I trudged all the way through The Story of Mankind, Smoky the Cowhorse, and Roller Skates recently, so I don’t know that I’d get much from rereading them so quickly. 2. I’m currently working on writing lesson plans for picture books in our school’s bookroom. A bunch of the books are Caldecott honor books I haven’t read yet, so I’ll read and post lesson plans for as many of these as I can track down. 3. What about the nonfiction books? I can’t find any information about a #nerdibert (#nerdbert?) challenge, so… anyone want to put one together with me?